Conducting more than 550,000 visits each year across Long Island, Queens, Manhattan, and Staten Island, our home care nurses at Northwell Health At Home are committed to bringing outstanding, innovative and award-winning care Northwell is known for right to the patient’s home. A commitment that has led our home care services to be recognized among the top 500 providers nationwide three years in a row by Homecare Elite and earning the Joint Commission’s Gold Seal of Approval for Heart Failure Certification – one of only a handful of organizations in New York State to achieve this distinction. Serving as the link between patients with their physicians to ensure continuity of care, home care registered nurses help patients in the comfort of their own homes. Traveling to see their patients helps build a close bond between the nurse and patient while awarding greater flexibility and autonomy outside of the hospital setting. Meet two of our team members and hear why they love being home care nurses at Northwell Health At Home. 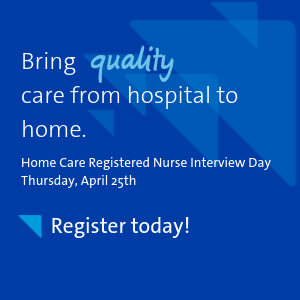 What do you love about being a home care registered nurse? Working as a Home Care nurse has given me the opportunity to see “behind the scenes” in my patient’s life. Many times, there are challenges at home that contribute toward a patient’s illness and access to healthcare, such as lack of transportation or the inability to read small print on medication bottles. Working in home care gives me the ability to prioritize my patients’ needs and provides flexibility in my day. Why is the work of home care nurses so important? As a home care nurse for Northwell Health at Home, I have the opportunity to help my patients transition easier from hospital to home. Many patients have been away from home for weeks, sometimes months, and they are overwhelmed when they arrive home. Often, they have new medications or changes they don’t understand, wounds that have not healed and different types of equipment that are required. Returning home doesn’t always mean their skilled needs have ended. Patients and their families require support and education. I can help the patient prevent another hospitalization and have the best possible outcome. What advice do you have for people looking to become home care nurses? When considering a career in home care, you must have flexibility as well as good communication and organizational skills. The home care nurse is responsible with coordinating all services the patient requires at home including physical therapy, occupational therapy, speech therapy, home health aide services and social work in conjunction with the patient’s physician. Timely follow up when changes are made in the patient’s plan of care, treatment or medications is crucial. The nurse is responsible for coordination with the multidisciplinary team on a regular basis to best meet the patient needs. I’ve worked in a lot of different areas of nursing and for me, I feel that home care gives me the opportunity to really build a relationship with my patient and their families. It encompasses the whole picture which allows us as nurses to treat and help our patient heal better. Patients heal better at home. Home care nurses provide the proper one-on-one education, therapy, and overall care to help patients remain home and more independent. The beauty of nursing are the opportunities we are able to have in caring for patients, whether in a hospital or at home. Home care nursing is more than just medicine and diagnoses, it’s helping the patient live their best life in the place they feel the safest – home. If you enjoy a more personal relationship with your patients, it’s a great avenue.